OUH - Inst Cancer Gen & Inform. 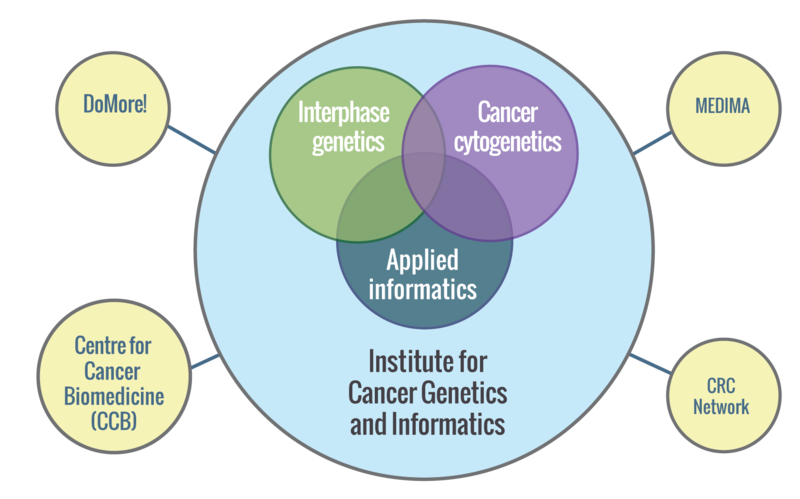 The Institute for Cancer Genetics and Informatics performs research in biomedicine and informatics to develop and establish new methods for diagnosis and prognostication, and applies these methods to large clinical series in collaboration with the clinical departments and Department of Pathology. Successful trials are then made applicable and offered as routine clinical practise, preferably established and performed by us. ICGI focuses on translational research by establishing new knowledge in the laboratory and then taking it to the clinic. This strategy requires an interdisciplinary approach, and a close integration between scientists, technologists and clinicians. Our basic research strategy is to focus on nucleomics, our innovation strategy is focused on microscopy based image analysis, and our overall goal is to enable better cancer treatment through new methods for improved diagnosis and prognosis of cancer. ICGIs main hypothesis is that large scale genomic instability is a driving force in cancer development. Our goal is to understand and describe the organisational changes that genomic instability causes in DNA- and chromatin structure in cancer cell nuclei, i.e. nucleomics, and to link these changes to patient outcome. Our research approach constitutes a difference in choice of the depth of resolution most research groups traditionally choose when studying genetic and epigenetic changes during carcinogenesis. However, there is nothing in our approach that is conflicting with current knowledge or trends, it is rather an original contribution to the field. ICGI’s strengths are our close cooperation with the clinic, our interdisiplinarity at the intersection of computer science, biology and medicine and our innovative development of new research tools which takes advantage of a strong cooperation with the industry. We perform original research, and are able to work all the way from idea through analysis and software development to publications, patent applications and product development and clinical implementation. An example of our translational strategy is cytogenetic analysis of solid tumours, which during the last 20 years has gone from being an esoteric research activity to being an important tool in diagnosis, e.g. in distinguishing between benign and malignant lipogenic tumours, by finding either a 3:12-translocation or supernumerary ring chromosomes, as detected by Heim and co-workers and later established as a routine diagnostic method at the Section for Cancer Cytogenetics. Another example is our work with large scale genomic instability. Parts of this work (DNA Ploidy) started as a request from the gynaecological department, challenging us to find a method to identify those patients who would benefit from adjuvant chemotherapy after surgery for stage I ovarian cancer. We responded by establishing a mutual research project, and consequently developed a high throughput image based system for measurement and classification of DNA Ploidy, including hardware design and software solutions for controlling a robotic microscope, automatic segmentation of nuclei, automatic cell type classification and automatic DNA Ploidy classifications. During this process we have published a number of methodological papers in both computer science and biomedicine, IP has been secured through patent applications and a system has been commercialised and proven effective in a large retrospective trial. A routine diagnostic service has been established and the gynaecological department now requests this service for all patients with stage I ovarian cancer (and more). The Institute for Cancer Genetics and Informatics is located at Oslo Cancer Cluster Innovation Park, next to Radiumhospitalet at Oslo University Hospital. The Institute is also part of Centre for Cancer Biomedicine, appointed Centre for excellence in research by the Norwegian Research Council. The Institute’s work consistently supports the high international standing of the Oslo University Hospital, both through our contribution to medical services and through our research contribution. Whereas Development and innovation results in products, services and patents, and the diagnosis activity is measured by number of patients diagnosed, 41% of the total resources (human, monetary, time) are spent on research leading to scientific publications. The institute is headed by Håvard E. Danielsen. Link to "Centre for Cancer Biomedicine"